Has it been just over a year since he's been gone? It feels longer. His genius always lay in his originality, his total oblivion to what people thought or expected. His artistry shone like a blinding light even after all the scandalous dust had settled and the media had chewed him up and spit him out. As he moved to the beat of "Billie Jean" in a satin black jacket, heels on edge, his hips and shoulders swaying, he was the epitome of free expression. 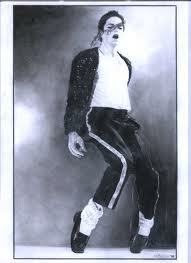 Michael Jackson is an example for writers, for artists everywhere. Let it flow, let your creativity spring forth as you snap to your music. His ageless grace and his rhythm inspire us to create our own rock and roll on the page. Twirl around, grab your crotch if you want, and let it fly. Make it happen.